Enquire or book a trip along Vĩnh Xương - Châu Đốc - Cái Bè - Cao Lãnh. Boarding at Vĩnh Xương with a welcome drink. Checking into the cabins. The Bassac casts off and lunch is served after a short presentation of the ship. By mid-afternoon, the Bassac turns into the Tan Chau canal, then casts anchor for a visit of a village on the bank: rice fields, wooden ship building yards. Boarding back in the late afternoon, and the Bassac resumes her trip to the end of the canal. Dinner is served as the Bassac sets anchor for the night on the upstream branch of the Bassac river. Breakfast is ready from 7:00 AM on. 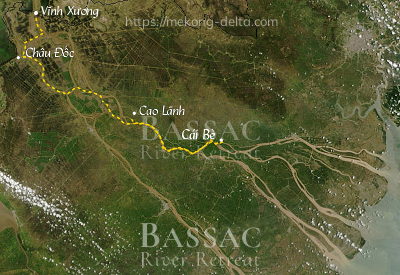 The Bassac resumes her journey towards Chau Doc. Disembarkment for a visit of Chau Doc. Market, floating fish farms, Chàm muslim minority and worship places. Before boarding, you may come all the way from Cambodia's Phnom Penh if you charter a speedboat, a trip that takes you through the frontier in no more than 4 hours. This makes the best use of time and sets you right on the spot to start an odyssey down the Mekong. Think of preparing a visa to Vietnam beforehand.